Jeep has launched its limited edition Jeep Renegade Desert Hawk SUV in the UK market. According to the automaker, they will be producing just 100 units for the UK market. According to the company, the Jeep Renegade Desert Hawk takes cues from the standard model while amping up the design quotient alongside a range of new exclusive features and functionality “inspired by the desert”. Jeep will be offering the limited edition Renegade in four colour options: Alpine White, Anvil, Black, and Mojave Sand (exclusive to Desert Hawk). Some of the features available in the SUV are 17-inch Low Gloss Black wheels; exclusive bonnet and rear body panel decals; exclusive seats in black leather and fabric with a Moab desert map logo on the seat base and electric lumbar support for the driver; leather-wrapped steering wheel; dual zone climate control; 6.5-inch touchscreen; Live services; Bluetooth and satnav; 7-inch full-colour thin-film transistor (TFT) cluster display; and cruise control. 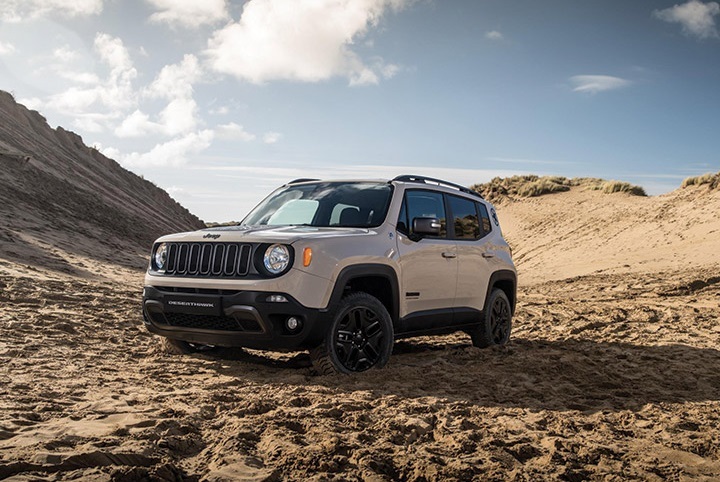 The Jeep Renegade Desert Hawk will derive power from a 170 hp 2.0-litre MultiJet diesel engine paired to a nine-speed automatic transmission. Other provisions on the SUV include the Jeep Active Drive Low (standard), Selec-Terrain system, 8.7-inch ground clearance, skid plates, Hill-descent control, and 19-inch water fording.